Thinking about the last three years of my college career, I can’t help but wonder how different things would be had I gone to another school. But before I can think about that, I have to think about how different things would be if I had done better in high school. I could blame my less-than-stellar grades on any number of things that were going on at the time, but I know that would be a copout. I could have done great, but I was OK with doing average. Once I got to college, that changed immediately. I wasn’t content with just passing. I pushed myself, hard, to get the kind of grades I could only dream of in high school, and found myself loathe to be content with anything less than an A-/B+. My friends and family believed I was being too hard on myself when I would get a less-than-desirable grade (a B or B-), but I knew I was holding myself to a higher standard than what I’d had in high school. Even though I only graduated high school three years ago, it seems, simultaneously, like ages ago, but just yesterday as well. When I walked by my alma mater a month ago, I felt like I hadn’t been there in a lifetime. But when I spend time with high school friends, it seems like we were just in class or at lunch together. Time is a funny thing depending on the context. When reminiscing about memories you hope to have forever, you view the past much like you view cars in your side mirror. They seem closer than they really are. But when you think about the memories you wish you could get rid of, you try to distance yourself from them, and push them as far back into the past as possible. 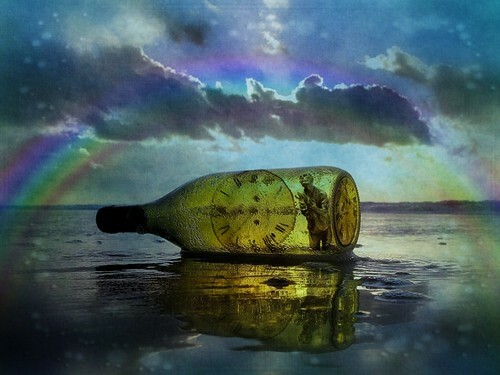 Some people believe that time as we know it does not exist. To them, the past is the present and the present is the future. If we all believed this, would we not then stop taking the little things for granted? Would we stop believing that our future is so far removed from where we are at this very moment? Would we behave as if we already have everything we want? This thinking is especially important with affirmations. Even though the desired outcome hasn’t happened yet, the affirmation is worded as if it were happening right now. This could then bring us into a discussion about the Law of Attraction and if it really works, but I’ll save that for another day. Back to the beginning of this post. At several points in the last three years, I’ve wondered about how things would be if I had gone to another college. But the more I think about it, the more I realize how foolish that thinking is. I am where I am, and I have done well here. It may not be my dream school as I once thought it was, but I have gotten a good education from it and formed a network that will serve me well upon my graduation. There is no point beating myself up about not getting into a “better” school. The term is relative anyway. Who’s to say that an Ivy League would have been better for me (and I must emphasis the for me, as an Ivy may very well be better for others). Where I am now may not be where I thought I would be three years ago, and it may not be where I will be three years from now. And while I can’t change the “past,” I can make the most of my “present” and shape my “future.” It is hard work to shed years of negative thinking, but in order to get the results I want, I must push myself to do so. I will falter many times, but all that matters is that I continue to get back up. And I will do my best to live each day as an affirmation of what I want right now. How quickly I see changes will depend on how much effort I put into changing my outlook. Some days will be easier than others, some days harder. But I will claim my future as my present and put the lessons of my past to good use. It’s time for the three to be reconciled.